What is a Connecticut Sublease Agreement? Connecticut Sublease Agreement: What Is It? 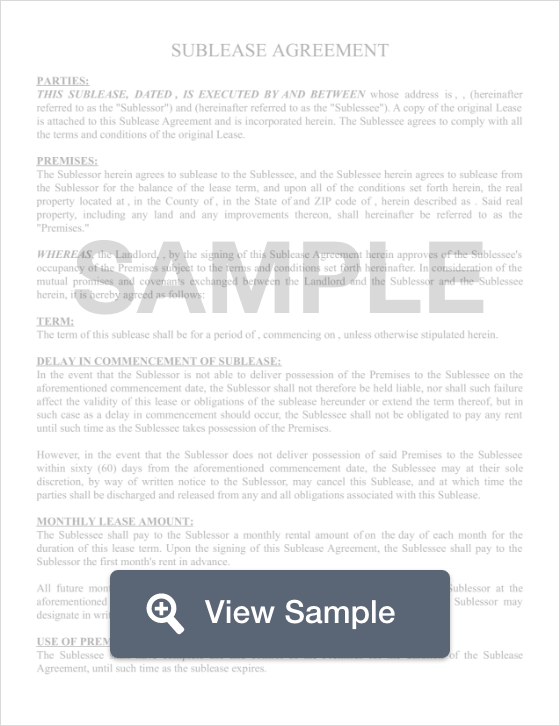 In Connecticut, a sublease agreement is a legal agreement between two tenants, a sublessor and a sublessee. In this situation, the sublessor is the individual who originally signed the lease, and now, for whatever reason, wishes to find someone else (a sublessee) to live in the apartment and pay rent in their place. This situation is common, as anything can occur in the duration of a year-long lease. Sometimes a tenant may have a family emergency where he or she must leave town for several months, other times the original tenant may be relocating or moving into a permanent home and no longer wish to remain in the apartment. These situations are common, and the original tenant may find a sublessee to take his or her place in the unit. What is important to note in a sublease agreement is that the original tenant’s name remains on the lease while this sublease agreement is in place. This means that it is very important for the sublessor to vet and stay in communication with the sublessee, as any damages to the unit or late rent payments become the responsibility of the original tenant. Connecticut’s Tenant/Landlord Law does not provide a lot of leniency when it comes to allowing a tenant to sublet his or her rental. If the lease does not specify whether or not a tenant may sublet the unit, then it is highly advisable that the tenant has a conversation with the landlord and receive written permission to sublet in order to protect all parties.